Total vehicle-animal collisions in North Carolina by year. With temperatures dropping and daylight saving time over, it's again time to watch for reindeer on roads. OK. Maybe not reindeer, but regular deer, at least. Animal-vehicle collisions have dropped in recent years, something N.C. Department of Transportation officials credit to safety measures. But the animals still remain a threat to drivers, especially in the cooler months. Over the past three years, these collisions have caused more than $135 million in property damage and 3,356 injuries. There have even been 14 fatalities. 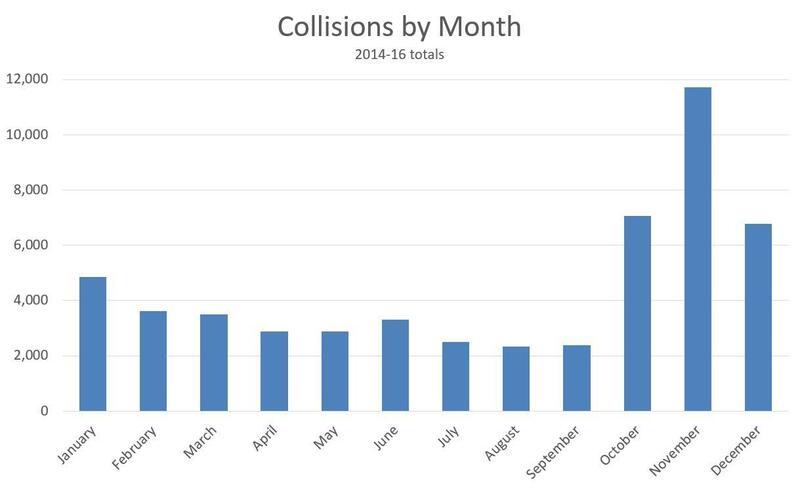 Vehicle-animal collisions in North Carolina by month. DOT Spokesman Steve Abbott added that – as cruel as it sounds – it's actually better to hit through a deer on the road. Swerving in an attempt to miss the deer can result in a far worse outcome. "If you oversteer to the right or left and lose control – that's what you see in the news quite often – that a car swerved to miss a deer, but crashed in to the woods." Wake County consistently has the highest total vehicle-animal collisions. That's due to a combination of factors including population and geographic size, as well as a mix of urban, suburban and rural areas. However, these kinds of collisions have been reduced in recent years. That's in part because of increasing development, which drives deer outward toward more rural areas. With Raleigh being such a wooded city, though, it will likely always see more such collisions than other urban areas. Mecklenburg County, for example, ranks fifth in the state, despite being the most populous county. "We think there's a combination of fewer deer out there, and also in the urban areas, just the urban build a growth and so forth are driving deer away," said Abbott. Not surprisingly the most dangerous times are at night, especially during the evening commute. 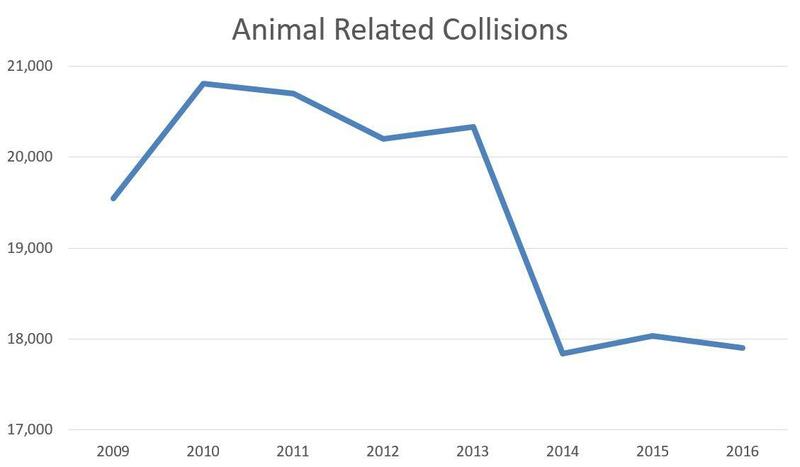 Animal-vehicle collisions by time of day. "That's the big thing, is your visibility that drops," said Abbott. "The heaviest travel times are in the morning and afternoon rush hour. And in the morning the deer aren't moving around that much, but in the afternoon and evenings they are, and you are going to be in the dark from now until next March." 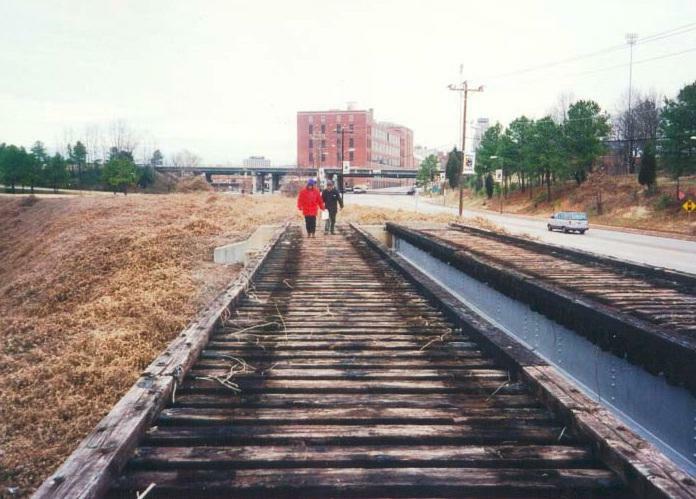 The state Department of Transportation wants to remind high school students during prom and graduation season that taking pictures on railroad tracks can be deadly.